I really wanted granola today. Like I was in dire need of granola. You know what I mean – you have a hankering for a specific food and you MUST HAVE IT NOW. So that’s granola and my relationship today. Couldn’t resist those crunchy bits. So I’m at Whole Foods, in the granola aisle (because they basically have an entire aisle dedicated to granola, which I find just a little bizarre) and staring at these like 1 lb. 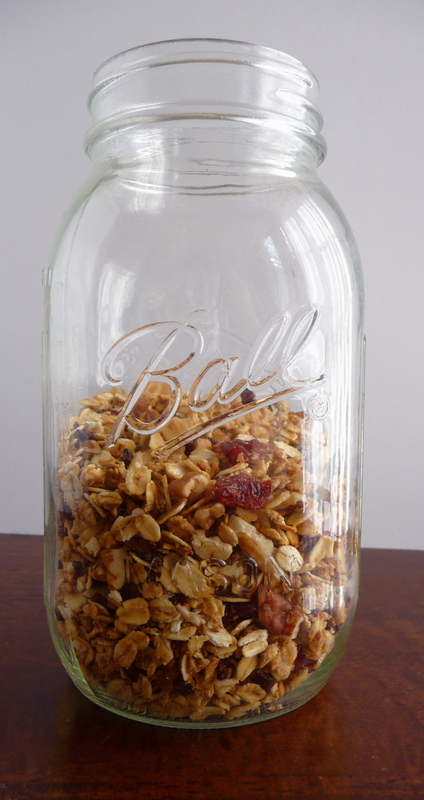 bags of granola for minimum $5, mostly $7 or $8. Ummm, no! I can’t honestly spend $7 bucks on a bag of oats and some sugar that I can buy for less than a $1 a pound in the bulk aisle. Bought some oats for 89 cents/lb. (hello, easy seller there! ), some pecans and some cacao nibs. The rest I had at home. Now what also prevented me from buying those expensive bagged granolas are the calories. There is so much sugar and fat in them! There had to be a better way for me to make my own less fatty. Hello, internet: you are always so useful. A little searching, scouring and “inspiration” from others recipes, I found a lower fat granola that had all the qualities I was looking for. Best part? Less sugar and fat by using fruit juice. I used pineapple juice because somehow I actually had some in my refrigerator (rare case, people, let me tell you!). Done. Preheat oven to 300 degrees F. Adjust your oven racks to be in the middle of the oven and as close together as your baking pan height allows (generally, one rung). Prepare 2 baking sheets by covering them in tin foil and spraying lightly with oil. Stir together dry ingredients in a large bowl, reserving the extra 1 tablespoon of brown sugar. Slowly drizzle the wet mixture into the dry and stir until all liquid is absorbed. Spoon the mixture onto the two baking sheets, using a spoon to level them. Place in the oven and start timer for 10 minutes. Stir the pans at 10 minutes and replace in oven for another 10 minutes. While oat mixture cooks, in the same bowl you mixed in, mix the reserved tablespoon of brown sugar, cranberries, pecan and cacao nibs. Set aside. After the second 10 minute timer goes off, remove pans from oven and spread in cranberry/pecan mixture evenly among pans. Stir to incorporate into the pans of granola. Replace pans in oven for a final 8-10 minutes. 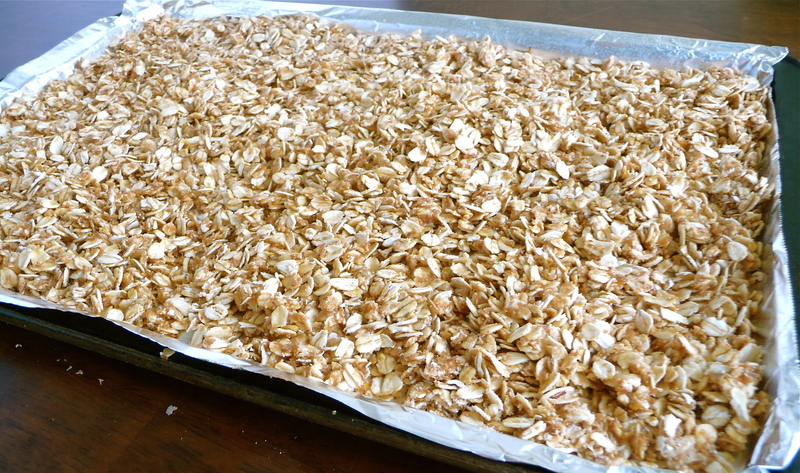 To test if granola is done, oats should be crunchy and toasted, not soft. When ready, remove from oven and let cool in the pans. Once cooled, transfer to some lovely glass jars and admire all of your hard work over breakfast tomorrow.